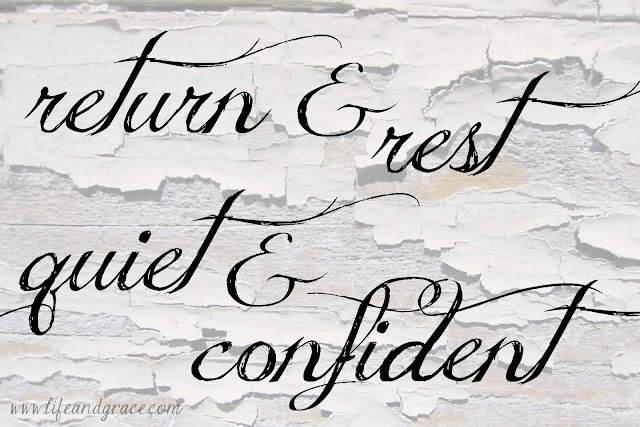 ... in returning and rest you shall be saved; in quietness and confidence shall be your strength. Stand in the way and see, and ask for old paths where the good way is, and walk in it; then you will find rest for your souls. These have been my verses over the last several weeks - the ones on which my mind lands when it's been wandering a bit too much. I feel like the Lord is speaking to me ... you've been through this before. The truths that will carry you are already burned into your heart. Return to what you know. Rest in Me. Tap into your quiet confidence, the confidence that knows I will get you through. Onward, good soldier. Love you sweet friend! You've been on my heart. Lifting you guys up. I love that Jeremiah passage. It came up in my summer study and I clung to it.